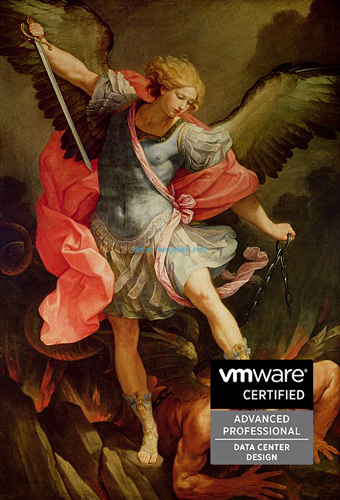 After months of studying I am proud to announce that Yesterday (24.04.2015) I passed VMware Certified Advanced Professional 5 – Data Center Design (VDCD550). I scheduled my first exam somewhere in February and I didn’t pass it. I manage to get 240 points out of 500 where passing margin is 300 points. I was quite disappointed but after exam I knew how the beast looks like. For the person like me where I don’t do designs by daily basis I had to admit that score wasn’t that bad but I still failed it. I was confident that I am capable of passing this exam. I scheduled immediately next exam right after Easter ( I believe it was 10.04.2015) but I rescheduled it at the beginning of April because I already knew that I didn’t have time to study. I think exam isn’t that bad because it really test your designing skills. However I would say in real world doing same things like I did during exam would be much easier. Why is that someone might ask? It is like that, because in real word design / project you can always (I would even say – should) ask questions to clarify some doubts. During exam you don’t have that luxury and you have to relay on your knowledge and experience. There were as well some small things which were unclear to me – you don’t know exam GUI and you have to work with a while to make it work. If you are used to Visio you will be disappointed with exam tool, because it works much more different. I will share some of my thoughts about exam itself in next paragraph. In this one I will focus on resources I used to study and which one were the best to use. Very useful book and I am really glad that I bought it. Without it I don’t think I would pass this exam. It has three full practice exams and enhanced practice test features. Although they were written for version 5.1, but still can be useful. Fantastic course! It is a must for you if you want to pas this exam. For the person like me who didn’t have so much exposure to projects and design this course was salvation. Scott is simple words explains what is design and guides you from conceptual design to physical design. I used this book during studies to VCAP5-DCA exam and it is even more useful to use it to learn towards VCAP5-DCD. VCAP5-DCD study group – Google Plus community where people ask questions and discuss answers. I don’t remember how many of those have I read, but trust me they are very important. It is hard to say which one are the most important, but I will list some of them: vDS, Storage, HA and many more. Hannu did great job going through exam blueprint and he updated some links as well pointed out some most interesting information. Links are a bit outdated but still you have to learn all items. What’s Next? Am I architect now? Architect – hmm, I definitely I am not there yet. I would say that passing VCAP5-DCD exam opened my eyes for so many things – it is like after you pass VCP and you realize how many things you don’t know yet. I have to admit though, that even learning towards DCD exam is very good journey. You start to think differently not only from VMware point of view but also from different areas. You learn to ask questions – what if? Not to mention job interviews, you jump in with fresh DCD knowledge and you shoot words like (risk, constraint, conceptual design and many more) and you got the job. congrats and good luck on the architect road! I follow your blog often for information and thanks very much for putting up the effort. First of all I would to congratulate you for having the VCP5-DCD. I am pretty much impressed the way you worked for the certification as well as motivated to get certified too. I’m pretty much a beginner and want start with VCP5-DCA followed by VCP5-DCV. Can you please advise where to start with and the material which i can find online to prepare for the exam? To answer your question I strongly suggest to start with Pluralsight course and book I mentioned. This will give you understanding what is required from you to pass exam.